I’m not here to cast aspersions on your choices in Indian food. I will do that somewhere else, possibly by phone, in a high-pitched mocking impersonation of you that will be neither accurate or flattering. Which is to say, I have opinions about Indian restaurants. Many of them are good. Rarely will I say no to Indian food. But if you ask me what is the best Indian restaurant in Oklahoma City, I will not hesitate to say Sheesh Mahal. I love a buffet as much as the next guy/gal/sentient food-writing blob, but quantity rarely outweighs quality. So while I have a deep and abiding affection for Taj, Gopuram and lunch at Ajanta, they are not my first choice for Indian cuisine. 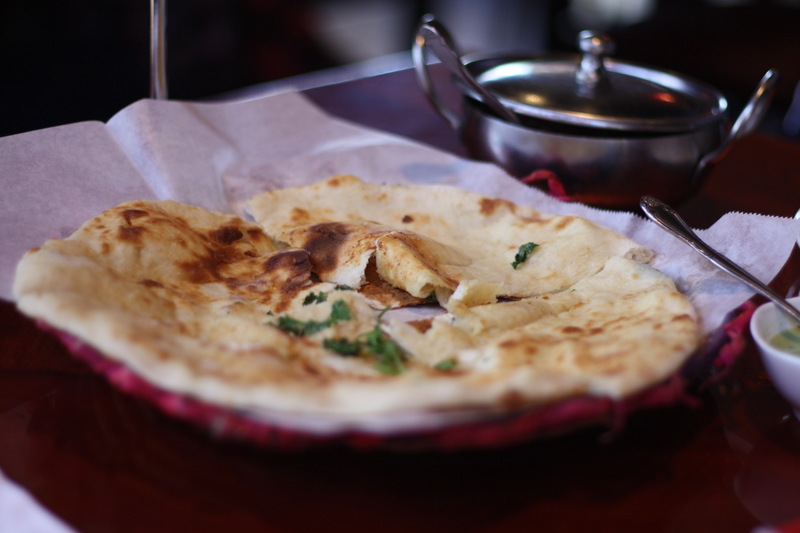 There are no such issues at Sheesh Mahal, where the owners have taken the profits and reinvested into the business. That’s a smart move in today’s fickle restaurant environment. Customers might like the “hole in the wall” vibe, but many see a lack of professionalism as a sign the eatery won’t be around for long. 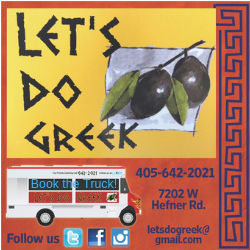 My early worries about Sheesh’s longevity have been put to rest with new menus and an updated interior. Better still, the food that began as excellent has only improved with time. Restaurateurs looking for the next big ethnic fast food hit need to pay attention. It’s time for a stand-alone samosa shop or food truck. 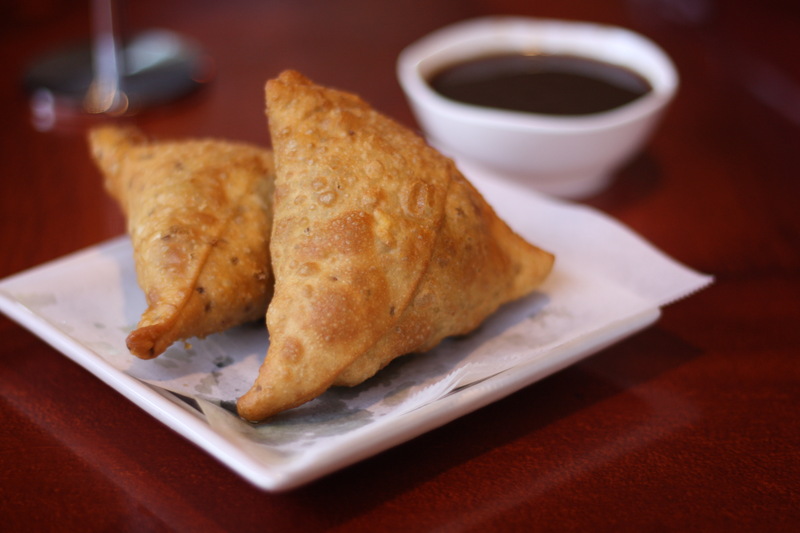 Samosas are deep-fried Indian dumplings filled with spiced potatoes or meat. This might be a good time to point out that Sheesh Mahal is actually a Pakistani restaurant, so while the seasonings and recipes are often similar, Sheesh serves plenty of dishes including beef. The samosas ($1.50 each) I had at Sheesh were wonderful. These fist-sized appetizers are like a deep-fried apple with a buttery crust and savory fillings. I think this dish is so perfectly Oklahoman that it should be added to our state meal. 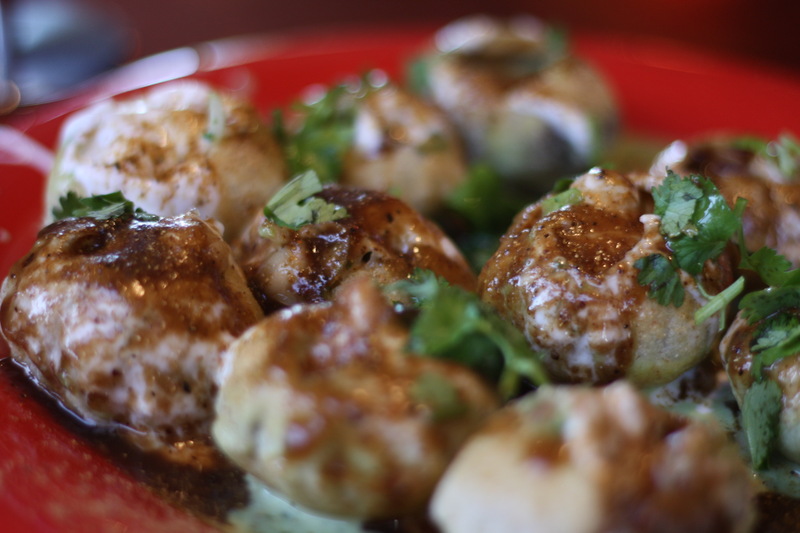 Gol Gappay ($3.99) was good, but not essential to the meal. Also called “pani puri,” this street food is a fried shell, or puri, filled with a chickpea mixture and covered in tamarind sauce and yogurt. For whatever reason, I didn’t expect this to be a cold dish. So while it might be a great summer appetizer, it just didn’t hit the right tone for a chilly Monday lunch. It was tasty, but there are so many other things on the Sheesh menu that I personally prefer. 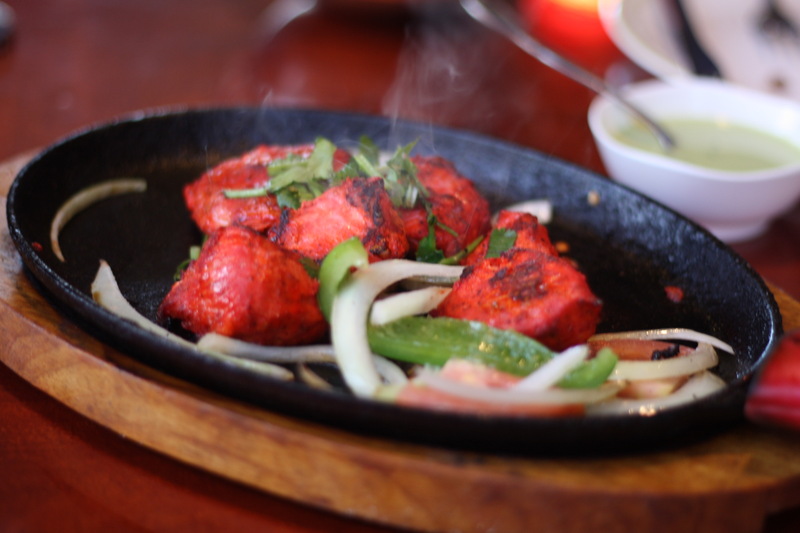 If you’re in the mood for a kebab, which you always should be, then the chicken teeka (sometimes tikka) boti ($4.99) is wonderful. It comes out steaming hot on skillet with onions and peppers, like an Indian fajita platter, but the most visually appealing part of the dish is the striking red of the chicken. Because it’s made with breast meat, it could get dried out while cooking, so for flavor and moisture the chicken is marinated in yogurt and spices, giving it a burst of flavor and a tender, moist interior. Now let’s get into the entrees, because while I love samosas and kebabs, the reason I go to Sheesh Mahal whenever I get the chance are the curries. If it’s your first time, you tender little flower, then I suggest the butter chicken ($6.99), which bears the most resemblance to that classic Indian-for-British-people classic chicken tikka masala. It’s mild and has a sweetness from the creamy sauce, but lots of rich flavors and textures. When asked if you want rice or naan bread, make sure at least one of your dishes has green masala rice. It’s light and gorgeous and it’s eagerly awaiting the opportunity to soak up all the sauce you pour over it. 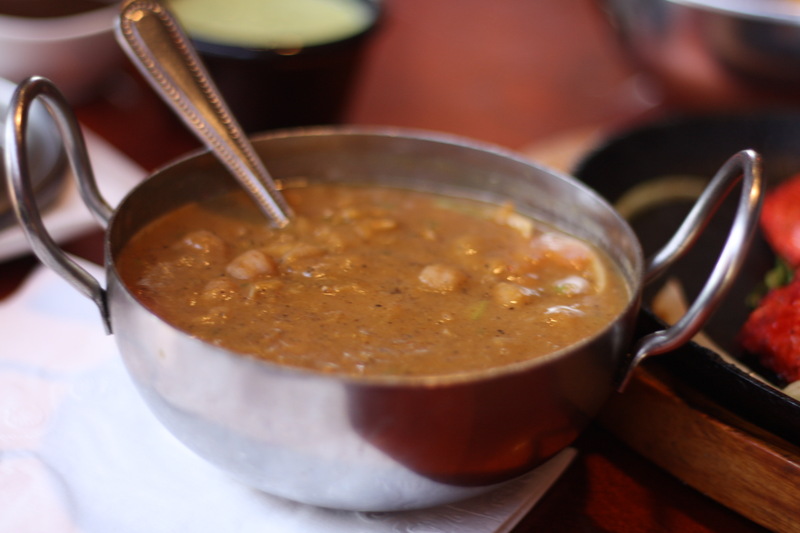 That’s especially important with a dish like chana masala ($4.99), a simple curry of chickpeas in a lusciously smooth sauce. The chickpeas fall apart in cooking, giving the dish a fuller texture and the rice is integral to capturing all that flavor. Now hold on for the best thing on the menu. It’s so good that I made somebody at the table next to me taste it. Yeah. That’s what I do. Why aren’t you my friend? 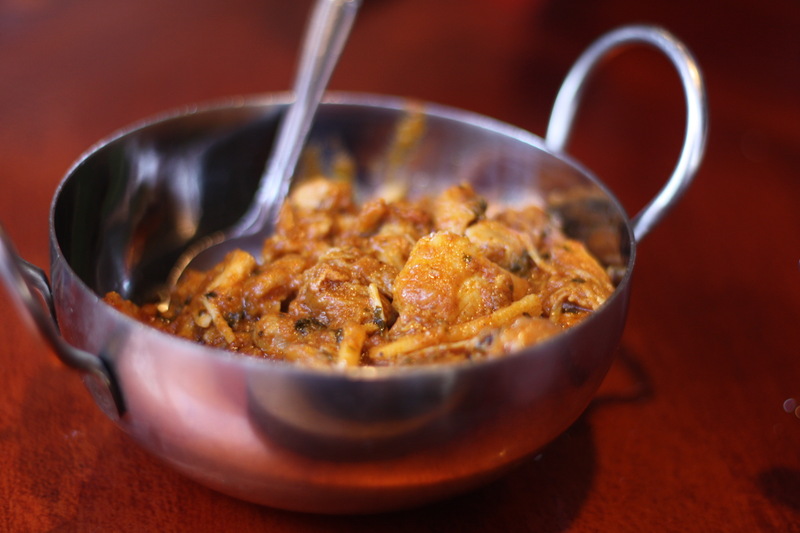 Signature chicken karahi ($6.99) has that luscious, oily sauce that drives all the boys wild. That is pure flavor. The chicken is cooked and shredded in an onion and tomato gravy and comes out a warm reddish-brown color with pops of green from sliced green peppers. The heat of the chilies is evident here, but it’s not overwhelming. I love it so much. I love the heat. I love the supple texture of the chicken and the sweet crunch of pepper and softened onions. It’s a hidden gem and something I haven’t seen at any other local Indian restaurants. 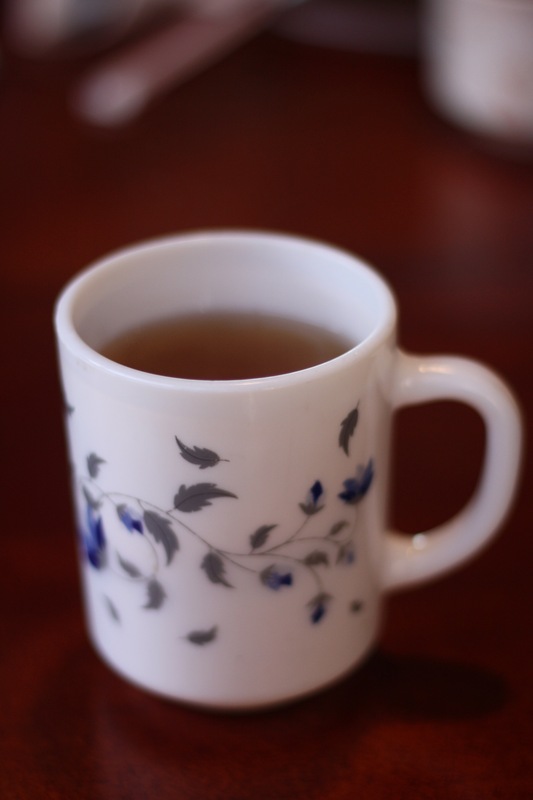 With that tickle of heat in your throat, might I suggest a dessert to help wrap up your meal? 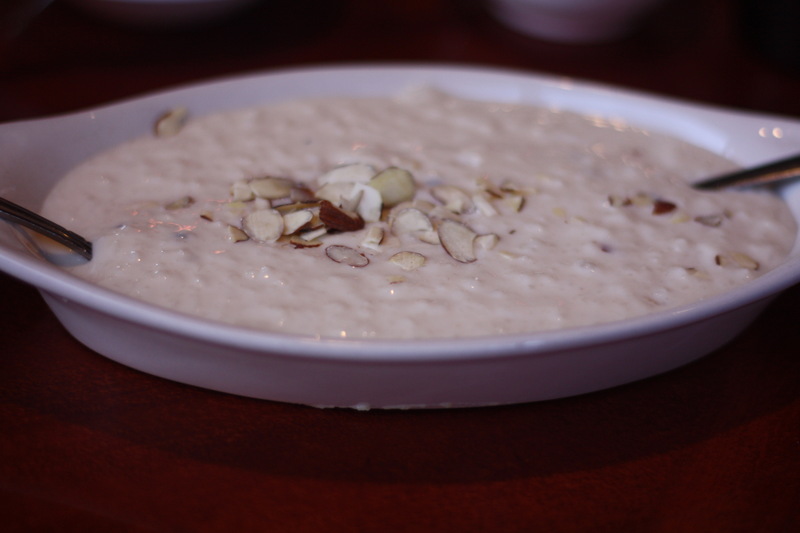 Because the kheer ($5.99) rice pudding is phenomenal. Rice pudding can be super boring, but the way Sheesh prepares it is anything but. The rice is creamy and the sauce cooling, but there’s a surprise waiting for you. A sweet pop of spice keeps it from getting dull and propels you through bite after soothing bite. Sheesh Mahal is where all of my Indian food dreams come true. Come dream with me.